GEODESIC STEEL COVERINGS are structures consisting of a series of steel rods and prefabricated multiple-grafting elements, such as to form a thick grid of triangles. The first geodesic dome in history was built in 1948 and was designed by the famous designer Richard Buckminster Fuller. The name “geodesic” comes from the very fact that this first structure in the shape of a dome resembled that of the Earth, hence the geoid. 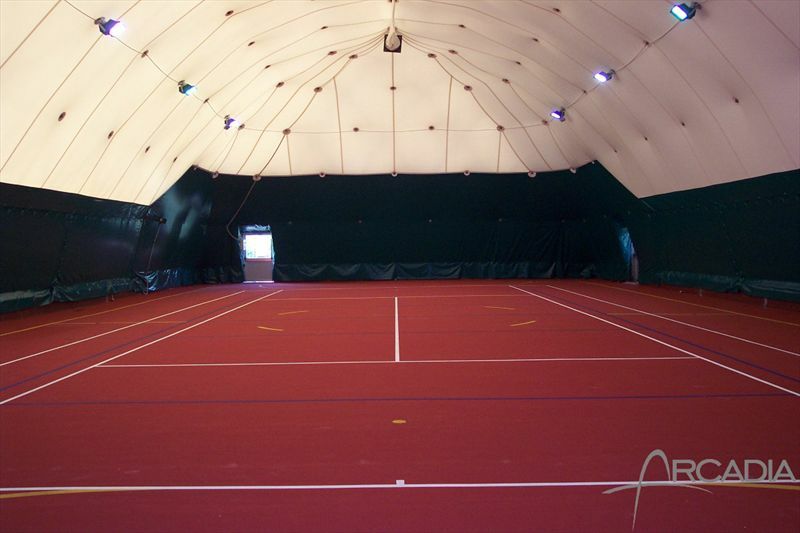 Fuller’s dome features lightness, dismountability and inexpensiveness combined with the ability to cover extended areas. For instance, a 30 kg dome can withstand loads up to 6 tons so as to overturn the fundamental concept of architecture by showing that by increasing the size, resistance increases instead of decreasing. The greatest strength of GEODESIC COVERINGS is indeed that they can cover large spans, with no need to create intermediate supports (e.g. abutments). A geodesic structure could theoretically cover any length, of course within the limits of the engineering possibilities that structural calculations may concede. 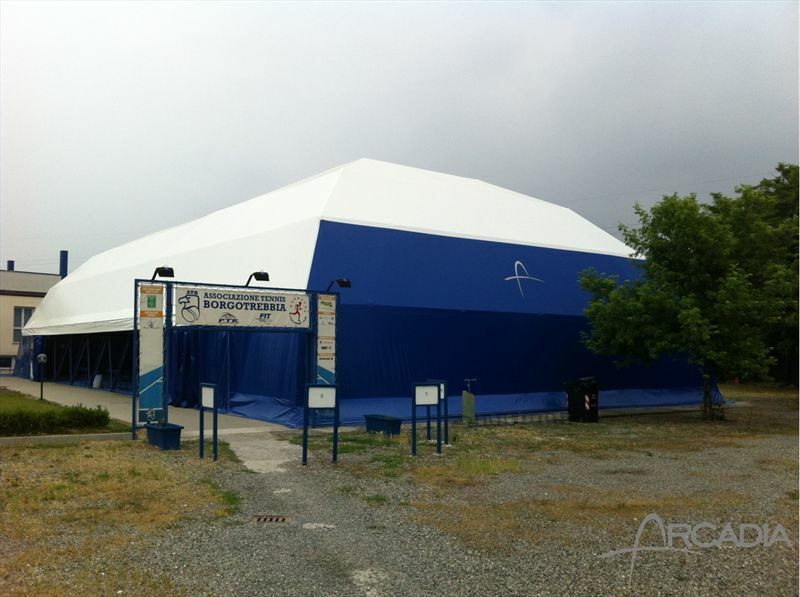 That is why this type of structure is also used in the construction of aircraft parking hangars or in large exhibition halls. It is built by following a spatial grid scheme where the external mesh stiffens; all of the structural members consist of circular-cross section tubular rods of suitable dimensions. For the purpose of connection, at the ends of the rods, special threaded clutches are fitted which are then fastened to the joints by means of nuts and bolts. Joints are formed out of spherical hot-press moulded pieces which vary in size as a function of the design specifications. These joints are specially designed to ensure a perfect connection of rods, structural stiffening and internal mesh. The advantage offered by this type of spherical joint is to avoid the wear-and-tear of the PVC topping surface. All the above is firmly anchored to the floor on a foundation that is conveniently arranged and perimetric to the pitch, made from concrete. The structure shall be tested for compliance with the standards that regulate sports facilities and steel structures in general. 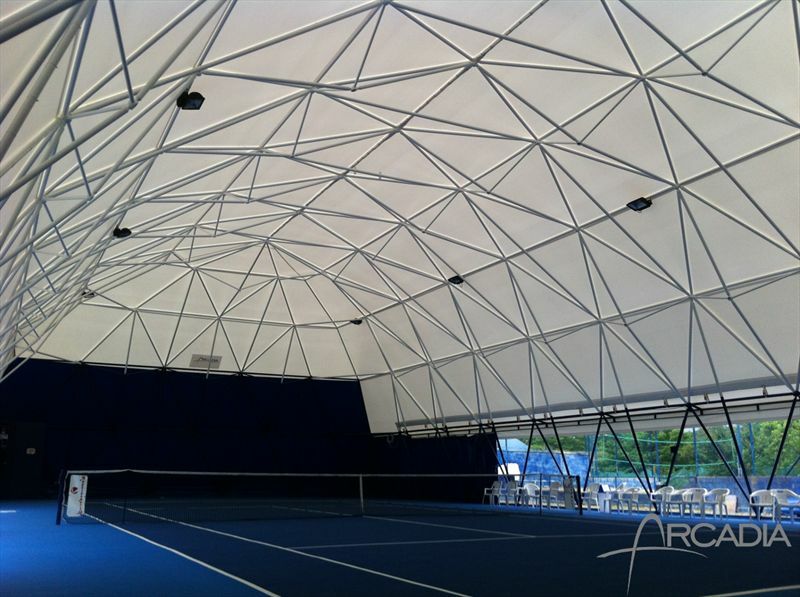 Given the large temperature fluctuations which sports coverings are exposed to, Arcadia has envisioned using a double insulating sheet, one for the inside and one for the outside of the steel bearing structure. The inside sheet hangs from metal hooks that are conveniently located on the sheet with special reinforcements, whereas the external sheet covers the entire structure. 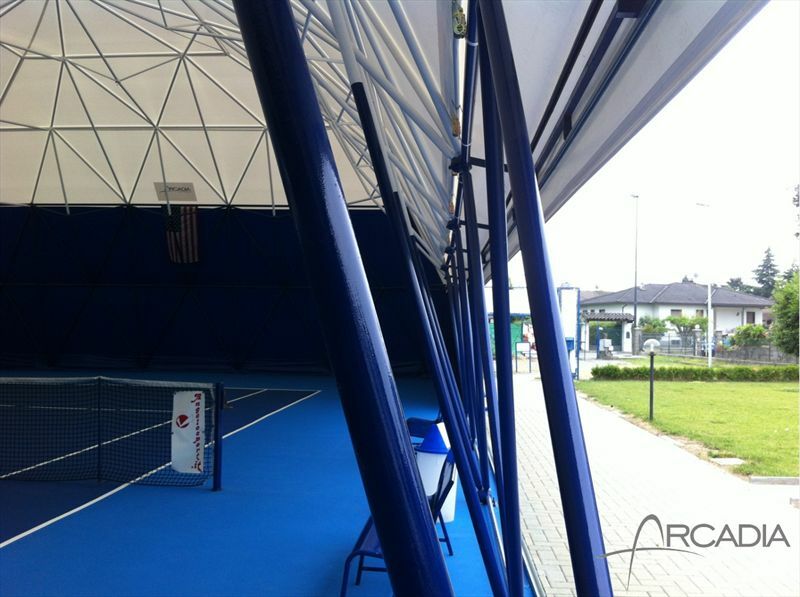 This technical solution allows an air gap to be created which insulates the structure and holds temperature from rising too much inside the sports facility. The total transmittance of the double sheet will thus undergo a strong reduction which can reach a limit value of about 1.60-1.70 W/m2*K., versus 8.0 W/m2*K of a single PVC sheet. The double insulating sheet allows you to considerably improve the thermal performance of the envelope, thus obtaining a better climate comfort and a reduction in energy consumption. 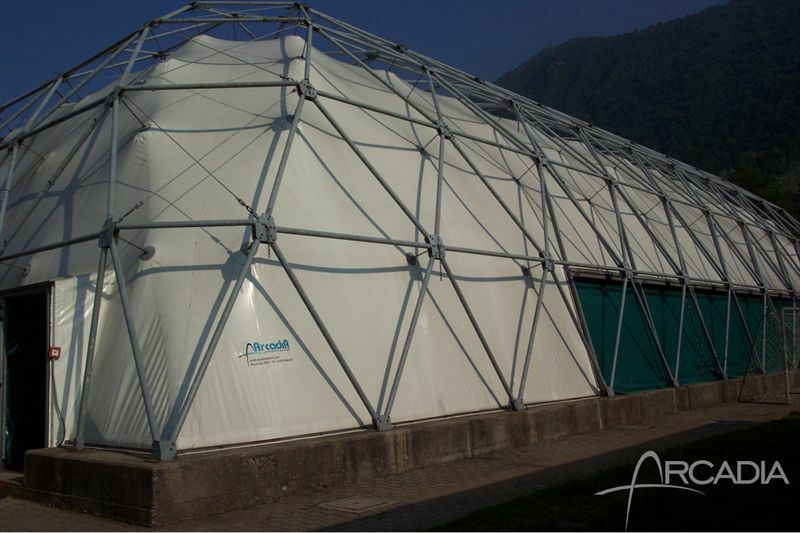 The material used is a special fabric specifically used for this type of structures: high-tenacity polyester, coated with PVC-based compounds on both faces, treated with a special dirt-repellent protective film against fungi and molds. The covering pack will thus prove to be fully resistant to U.V. rays and weather agents. - An internal insulated PVC sheet, white in colour, weighing 2 kg/m2, 3 mm thick.